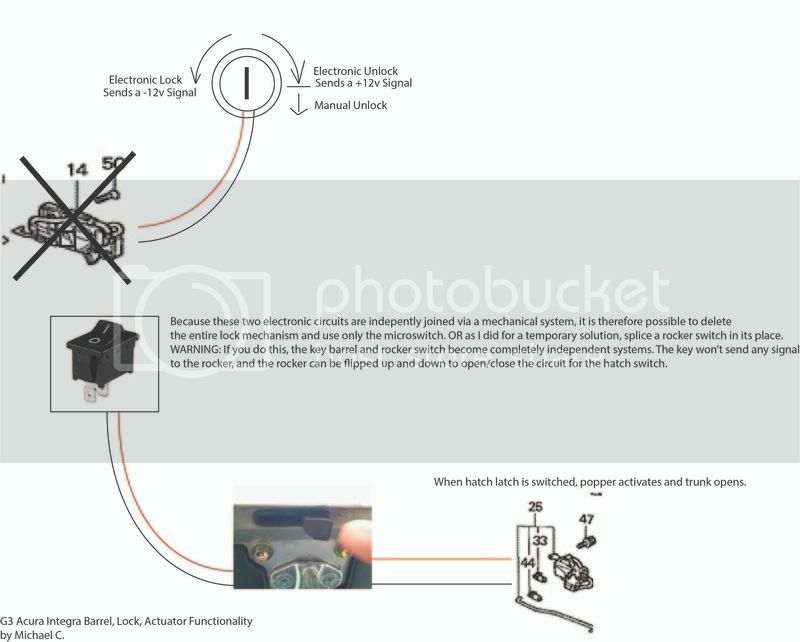 Folks, I kid you not, the whole broken hatch lock/trunk actuator issues have plagued me ever since I got the car back in February. Literally every piece of the mechanism was broken and I've spent months mulling over how to fix it. And yes I know this car is already 17 years old but I finally figured it out a solution I like tonight and I wanted to share how I fixed it. By no means am I any kind of engineer, but everything works exactly as it should now. So for those of you that don't want to shell out $70+ for the OEM setup let me show you have far technology has come since 1999. So first and foremost, there are 3 main components to the hatch mechanism. #25 electronically controls a gear that moves an arm that pops the hatch open. usually this breaks when the little internal tension clip snaps and can no longer exert enough force to clamp down on the big cog. It's a pretty flipping complicated little gadget that I guess was necessary in the 90's but now been easily surpassed by the modern actuator. For me, this was broken along with the rest of the mechanism and I actually followed the solution on this thread where member WillyWilly already found a solution 6 years ago which was to replace the entire assembly with a universal actuator. I picked mine up from Amazon. super good solution, cheap, simple solution and works well. After I fixed that and could now actually use the switch under the hatch to activate the trunk popper, I realized that I now couldn't ever LOCK this thing. The reason why that didn't come up in the past was because the popper was broken. But now that it was fixed I had to move onto fixing the next thing. 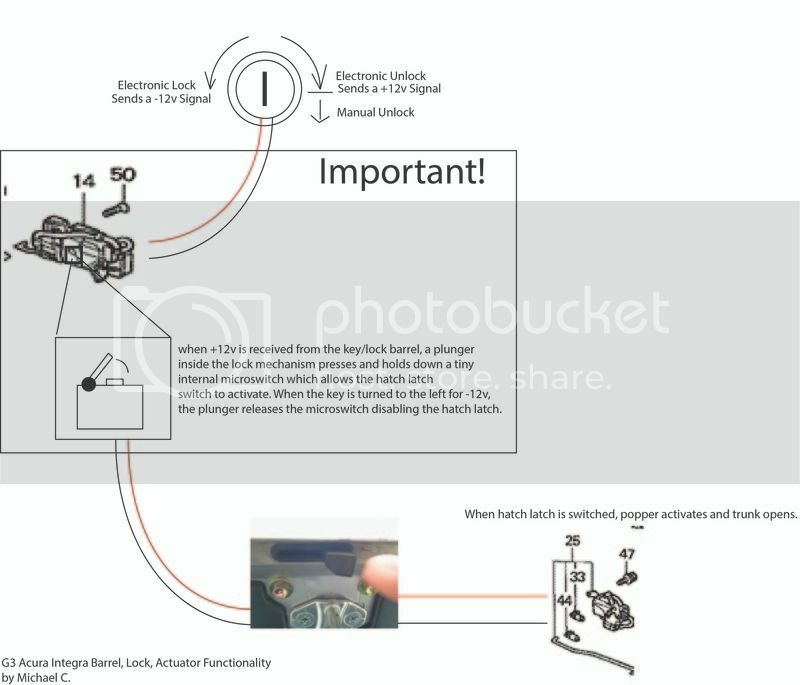 I don't have an exploded view, but if you ever open it up it's pretty complex inside; but essentially works as a "memory switch" to remember the state of the key turn so that the hatch can stay "locked" or "unlocked". It uses 2 separate electronic circuits but joins them together in one housing with a mechanical movement of the plunger connecting the two processes. As a halfway solution, I deleted the locking mechanism entirely and wired the two leads from the microswitch to a rocker switch. Doing this allowed me to at the very least, lock and unlock the hatch switch; but it was VERY inconvenient because I had to use the key to open the hatch and set the state of the switch and always still rely on the manual unlock by turning the key all the way to the right. 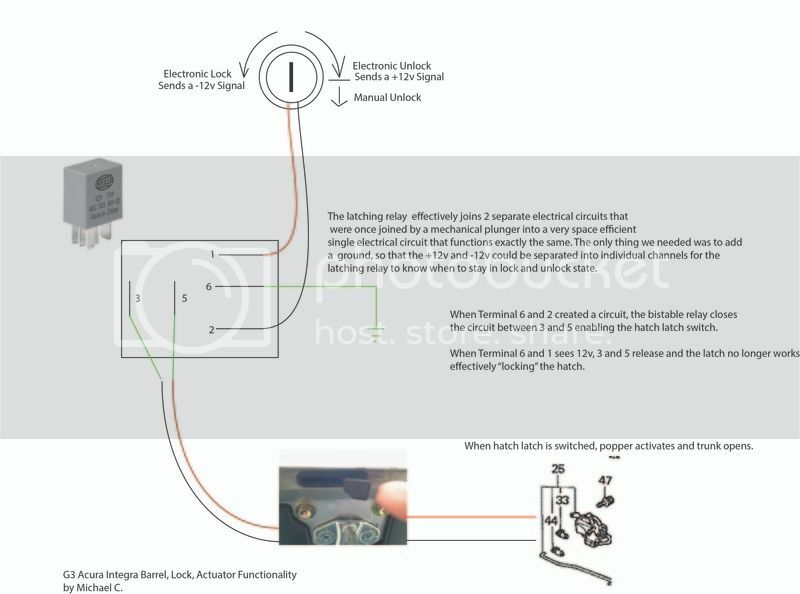 The bistable or latching relay!! At first, I wasn't sure if this was going to work, but looking at the diagram on the side of the relay showed me that if I had a -12v signal for "unlock" and +12v signal for "lock", 1 common ground, and an addition circuit that could be completed with this, it could all be wired to work exactly as it should have. The final result is a $12 latching relay doing the job of a $70 lock mechanism. Highly recommended if your latch, lock or actuator doesn't work. Thanks MikiMaru! I figured someone searching could get some help since I was struggling with this forever. It definitely is less susceptible to failure which is a good thing. the most challenging part was finding the bistable relay. 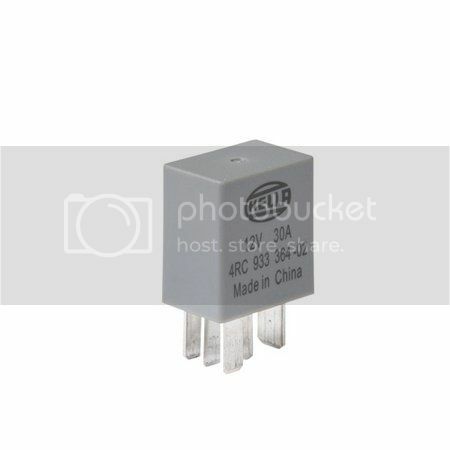 Would this be the same relay that you are referring to? Last edited by KhmerCrops; 11-20-2016 at 07:22 PM. That looks correct! 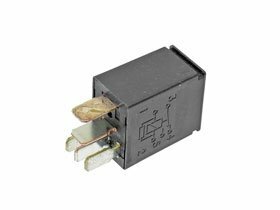 Just want to try to understand the diagram on the side of the relay to make it work correctly.